WINONA, MN USA - (January 24, 2019) - RTP Company, a leading global compounder of custom engineered thermoplastics, will showcase its thermoplastic pellets, sheet, and film products at the MD&M West exhibition in Booth #1715. RTP Company’s customized thermoplastics are unique in that they can be formulated for color, strength, conductivity, wear resistance, elasticity, and/or flame retardancy. These thermoplastic compounds are developed, manufactured, and sold to injection molders, original equipment manufacturers, and extrusion companies who use them to create a wide range of plastic parts and components. Highlighted this year will be “Thermoplas-Tips for Material Selection”. 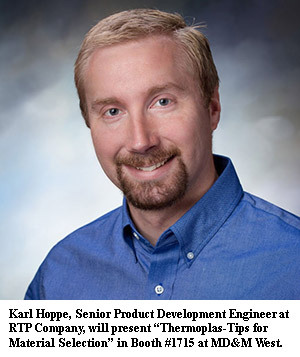 These brief, five minute technical talks will be presented by RTP Company Senior Product Development Engineer Karl Hoppe, who will guide visitors through some important tips regarding thermoplastic material selection for medical devices, equipment, and components. 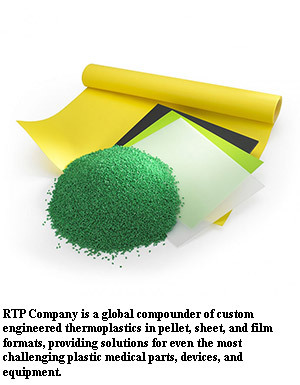 For more information on RTP Company’s thermoplastic compounds, material selection and more, please visit www.rtpcompany.com.